Christy hit the nail on the head when she said that I’m a ponderer. 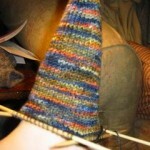 I’ve gone through 2 yarns and 5 patterns in order to settle on my sockapalooza sock. Cotton Surf comes in big 100 g skeins (enough for a pair). I like the idea of only needing one skein, but I always feel cheated because I never know quite how much to use. After reading Sara’s great post last week about a scale being your third most important yarn tool I decided to finally buy myself a postal scale. What fun! I weighed the ball (98 grams*), and wound off 48 grams (slightly less than half) onto my winder. I’ve started the sock with the half I wound, knowing that even if my weights are off slightly I should definitely have a little less on the wound half than the half left in the skein. Here’s my progress as of last night. 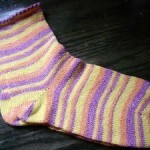 I had a few false starts with this sock. I started with US 3’s and had to go down to US 2’s to get a good fabric. 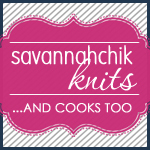 Now that I”m on the 2’s I love the way the yarn feels! I picked the cotton since warm weather is on its way and I thought my pal would be able to use them more often in the cotton. The Cotton Surf is a superwash so they’re easy care. * Curious why the skein only weighed 98 grams instead of 100? Yarn weights can vary depending on atmospheric conditions. Yarn retains water, so if it’s dry out (like now in the middle of winter with the heat blasting) the yarn will probably weigh a little less than say, August when it’s 80% humid. To account for this you’ll sometimes see “under standard conditions” listed on the ball band. ps – If you haven’t already done so, go see Vicki’s amazing St. Brigid. It’s gorgeous! I didn’t know that about yarn weights. I was just weighing sock yarn the other day. 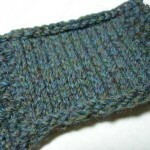 But I had three skeins of Sockotta and only one was about 2-3 gms lighter. ‘Course they came from different places. I think I have to go down to a US 1 for my sock. Same color. I’m using that colorway too! 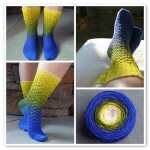 Looks like lots of us have good taste in sock yarn, huh? I’m really liking the bright colors, it looks like summer to me. Such bright, wonderful colors!! Puts the “palooza” in sockapalooza! I have that yarn. I just haven’t used it yet. I almost bought another skien of it recently. 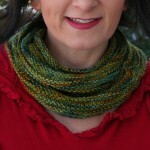 I am hoping to meet you at Maryland Sheep and Wool. I love the color combo. BTW: I was looking through your Future projects pictures…you’ve made me fall in love with Rebecca…I just bought #27 and am going to buy 29…grrrrr…. 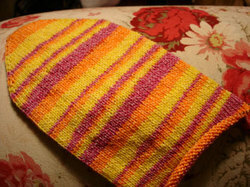 Hey, what a great idea to measure your yarn by using a postal scale, I want to try that. Beautiful colors by the way, can’t wait to see the finished sock! Your socks are beautiful! I hope the ones I’m making turn out as well. I’ve been doing that with a lab scale at work. Of course, a postal scale would save me the trouble of having to use a plastic bag between the yarn an the scale. Even if I clean it, I know the yucky things that have been on that scale before and I want my yarn away from them. Beautiful sock. I love those colors. Those are very pretty tutti-frutti colors on that sock. Pretty, pretty! Love those colors. Those are going to be some FUN socks. Have fun knitting them.